I went outside to take some photos of finches, but of course they flew away! I was able to capture these images of this fawn in the field. The adult deer around here are not afraid of humans. In fact they will stare you down! As I approached this fawn, it ran off, but did turn back to peak around the trees to see if I was still there. When it saw that I was, it gave a warning call and took off. I think this was the young deer that was listening to the sound of the raccoon (see previous post). The field has not been cut yet this season. We have had so much rain in the past three months that it is impossible to get the tractor out there; it is wetlands. I love how the grasses are growing tall. The red winged blackbirds and tree swallows love it too. They are in abundance this year. I imagine many other creatures have taken up residence here as well. I hope my relatives choose to keep this section of the property looking this way. It has been an exciting, anxious time here. We live in a suburban neighborhood on a busy road, but we have wooded areas around us enough for much wildlife to call home. Yesterday morning it was bright and sunny. At around 9 a.m. or so, the smell of skunk made its way through the windows. Shortly after that we heard the shrieking sound of a raccoon. Bob went out to investigate. He saw a baby raccoon climb up the large maple tree in our yard. I came out a few minutes later to see the little guy hanging from a tree branch trying his best to get the rest of his body up onto it. He was up probably about 25 feet! I thought it was he who was screaming. Bob said that the sound was coming from near or under the papermaking studio deck. It was there that the skunk smell was strongest. It was time to head to church, so I said a prayer for the baby raccoon. I didn't want to come home to find him lying on the ground with a broken neck. Back home a few hours later, all was quiet, though the smell still lingered. After lunch Bob went out to cut the grass. He saw the baby raccoon walking along one side of the fence that surrounds the vegetable garden. The raccoon found an area to nestle into and settled down there. I came outside, Bob pointed him out and I noticed that flies were all around him. Thinking he was either hurt or had rabies, I called animal control. My concern was that if he were to become another animal's prey, that they didn't contract rabies too. (We have coyotes, red foxes and hawks here.) The animal control officer came by, prodded him with her stick to see if he was injured and to evaluate his condition. He seemed alert and uninjured in her opinion. She said the flies were around more than likely because he urinated or defecated on himself. Her advice was to leave him there and hopefully his mother would come find him that evening and bring him home. She said that if he was still there after 24 hours, to call the office. They would try to locate an animal rescue shelter that had an opening. This morning I checked on him before heading out for the day. He was still there, curled up, awake and alert. He looked at me curiously. I had my camera with me and he posed beautifully! When I got home, it was raining and he was still there. He was trying to climb up the fence. He didn't like being in the rain, I'm guessing. I telephoned animal control again and this time had to leave a message. A few hours passed and I could hear him calling. I went outside. He was still there. He continued to call for a while. Back inside, I saw a young deer come out of the woods, walk up the old road, and when it got close to the raccoon, it stopped. I could see his ears moving, individually, in different directions, depending on where sounds were coming from. He was focused on the raccoon's call. He took a few steps, stopped and listened. The was looking off where the old road slopes down and is dense with trees, brush and brambles. I didn't understand why he was looking there, when the raccoon was on the opposite side. The deer gave up and headed towards the house. Concerned he might be interested in the hostas, I went out to the front porch. He saw me, turned and ran back into the woods he came from. Again, I went to check on the baby raccoon. His calling had stopped. He was gone! Maybe he was calling and walking and did end up off the side of the old road where the deer had been looking. I'm glad he was smart enough to find some better shelter. The rain was getting heavy and it didn't look like his mother was going to be around. What happened yesterday morning between the raccoon and skunk? This is Bob's theory: For many years woodchucks have made their home under my papermaking studio (it was a tool shed before that). He thinks that this year a raccoon moved in first and had her babies there. (A few weeks ago I was in the studio and I heard this loud, shrieky crying. Bob said it was probably baby woodchucks. I've never heard the sound a woodchuck makes, if it does make one, and now that I heard the baby raccoon, I believe it was/is a raccoon family living there.) Maybe last night the mother raccoon and her babies were out foraging and a skunk went to check out their home. Momma and babies came home and discovered the skunk there. (that story sounds a bit familiar!) Momma started shrieking, the skunk got frightened and sprayed. Did they physically fight? If so, could the skunk seriously or fatally damage the mother raccoon? I don't know enough about these animals, but I think a skunk is less dangerous than a raccoon. That is the end of this story, at least for now. I do have another story, shorter, to tell you, but will do that in a new post. Experiencing this, I am reminded of the wonderful Thornton W. Burgess stories I used to read to my children. I know he saw these types of occurrences all the time and they were what made his stories so wonderfully interesting - you just knew they were based on first hand knowledge. Earlier this year, one of the seed packets I ordered from Pinetree Garden Seeds was Carouby de Maussane Snow Pea. The distinction with this variety is its two-tone purple flowers. I planted them in early April and they are beginning to flower. it is difficult to see the birdbath now! The window box and pots have been planted, the wisteria is growing well. Still no flowers on it yet. My earliest recollection of roses are seeing them at the homes of my great aunt Catherine and my grandmother Ceil. Aunt Catherine and her husband owned a brownstone in Brooklyn, NY. I can remember being in her small backyard only a few times. There was a rose that had the most wonderful smelling crimson-red flowers growing there. She would cut them and place them in a vase in her tiny kitchen. The same type of rose grew in front of the steps of my grandmother's little house in Queens, NY. It was there when I was a child and was still there when she moved out of her home a few years ago. I can't be certain, but I think both of these roses may have been the hardy rootstock that less hardy hybrid roses had been grafted onto. I remember reading an article once about a certain rose found, growing neglected, in many cemeteries. It was determined that a variety of hybrid roses were planted in these cemeteries, and subsequently died, but the rootstock sprouted, grew and thrived. Great symbolism, isn't it? My real introduction to roses came in the early 1980s when I worked in a garden center. In early spring, dormant Jackson & Perkins roses would arrive in colorful cardboard boxes and be set out for sale. The stems were short and stubby and were coated with wax to prevent dessication. Some of these sold at this stage, but it wasn't until mid and late spring when the plants had leafed out and put forth their blossoms, that they were scooped up by delighted customers. Sunsprite - a vigorous, fragrant, prolific bloomer with dark glossy leaves. It is disease resistant and pretty drought tolerant. It is a floribunda rose. Ballerina - a hybrid musk rose that is a climber. It has a light scent and produces clusters of small single flowers followed by rose hips in the fall. Depending on the weather (cooler temperatures and adequate moisture is needed), it will bloom for a long period. Gertrude Jekyll - fragrant pink flowers. The first of the three to bloom. It grows tall. Evelyn - a more compact plant, better suited to my garden than the others. The flowers are very fragrant. The color is a very pale peachy-pink. Just lovely! Othello - the most robust of the three I grow, this bush produces many extremely fragrant magenta-red flowers. I save the petals for pot-potpourri as the color and scent lasts a long time. What memories do you have about roses? What roses do you grow? What comes to mind when you read or hear the word “rose”? Fragrance? The color pink? A single, five petaled variety that enables you to see the stamens? Or the voluptuous cabbage roses that have multitudes of petals so packed together that it is impossible to count them? Hybrid teas? Valentine’s Day? Your grandmother? Whatever that image or sensation, there is something you can recall. Who has gone through life and not encountered a rose in one form or another? Roses are native to every temperate continent on earth. There are roughly 300 rose species and anywhere from 13,000-16,000 varieties, depending on the source. Every culture from antiquity to today has held roses in high esteem. They have been cultivated in some parts of the world for over 3000 years. 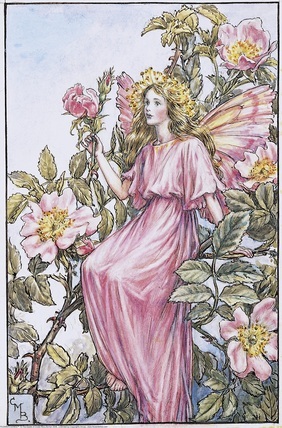 Beloved and treasured for its beauty, fragrance and medicinal qualities, the rose began its worldwide spread from China. Traveling through Ancient Persia, India and Syria, it was introduced to Egypt, Greece and Rome. Roman soldiers brought rose plants with them to France and England. Cultivated roses were brought to North America by the first colonists. Roses have symbolized beauty, youth, love, passion, purity, innocence, secrecy, war, and more. It is said that Cleopatra filled her pillows with rose petals and once created a carpet, 20 inches thick, of fragrant rose petals to greet her lover, Antony. The Romans hung wreaths and garlands of roses from the balconies at their games and feasts, showered their guests with petals and sprinkled them in their baths. Associated with Harpocrates, the god of silence, the rose became an emblem for silence and secrecy. During Roman council meetings, a rose was hung above the meeting table, symbolizing confidentiality of all that was discussed. From this we get the term sub rosa, Latin for “under the rose”, and means “in secret” or confidential. (Write “sub rosa” on a letter next time you send it!) The classical ceiling rosette decoration is an extension of this tradition and is still used today, though its meaning has long been forgotten. In India, rose petals were crushed and molded into beads, then strung to create prayer malas. Eastern Christian monks adapted this tradition in the third century, renaming them rosary beads. For instructions on making your own rose beads, contact me and I will email them to you. You can find instructions on the web, no doubt, as well. Place water, vodka and rose petals in clean glass jar. Cover and shake. Store in refrigerator for one week; shake daily. Strain out rose petals. Pour into an atomizer, perfume bottle or decanter. Apply with a cotton ball or spritz on. Store up to two weeks. *based on recipe by Kate Carter Frederick, as appeared in the 1999 Simply Perfect Roses magazine published by Meredith Corporation, Des Moines, IA, USA. 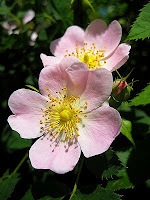 Dog Rose, Rosa canina – Native to Europe and parts of the United States. It grows six feet and four feet wide (1.8 m x 1.2 m). White to pink flowers, up to 2 inches (5 cm) in diameter bloom in summer and are followed by clusters of bright red fruits, called hips. The hips of roses contain high doses of vitamin C. They were harvested from the countrysides during World War II. 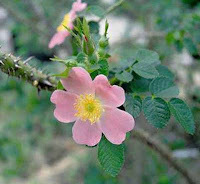 So valuable to the country were they, the dog rose became a patriotic symbol. Field Rose, Rosa arvensis – A common hedgerow plant, this rose grows 12 ft x 8 ft (3-3.7 m x 2.4 m). Single white flowers, 1.5-2 inches (4-5 cm) in diameter bloom in July, followed by rounded hips loved by birds. 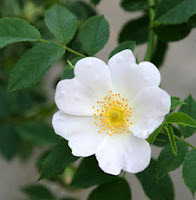 Sweet Briar or Eglantine Rose, Rosa rubiginosa or R. eglanteria – This is Shakespeare’s Eglantine rose. Growing 10-12 feet (3-3.5 m) tall, this species has scented foliage as well as fragrant flowers. The leaves have a strong apple-like fragrance. Showy hips in autumn attract birds. Note: This article was written by me for the blog 12 Months in View. Click on the photo for a link to the original location. A bibliography of the reference books I used is available upon request.